In the spring of 1936, Pauling met another man who would greatly influence his approach to the protein problem. 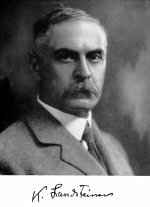 Karl Landsteiner was a distinguished, silver-haired, Austrian-born Nobel Prize winner who had saved thousands of lives by discovering how to make blood transfusions safe. He basically invented the field of blood typing, creating the ABO system used today. Landsteiner had demonstrated how transfusing the wrong type of blood could kick off an immune reaction in which the mismatched blood could be attacked and clumped together in the body of a patient. The clumping was done by blood proteins called antibodies. Landsteiner was renowned as the world's leading expert in immunology, the study of the body's defense mechanisms against infection and disease. Antibodies were soluble proteins that were at the heart of the immune response. Under his influence, Pauling began to read about antibodies, fascinating molecules that somehow knew how to recognize and attack invading organisms like bacteria and viruses, and helped the body fight off illness. They were fantastically precise little weapons, able to distinguish between targets that differed by as little as a few atoms. How did they do that? Landsteiner told Pauling what he knew about antibodies: that they were pure protein, they were enormous, and they were all remarkably similar to one another, roughly the same size, seemingly the same shape, and composed of the same general mix of amino acids. This, Landsteiner explained, was a puzzle: How could they all be the same yet each was specifically targeted toward a single invader? Landsteiner knew of Pauling's work on denaturation and asked for his help in solving the mystery of how antibodies could recognize and attach to specific targets. Pauling bought a copy of Landsteiner's latest book on immunology, read it on the train, and began thinking. Proteins, he thought, were all about shape. He began to conceive ways in which the molecular shapes of antibodies might determine their ability to recognize and latch onto targets. Landsteiner and other immunologists had, over the past few decades, developed precise and interesting ways to test and measure antibody activity. Pauling started to think that antibodies offered an inviting way to study protein structure. In the late 1930s, Pauling started directing much of his research activity toward antibodies. 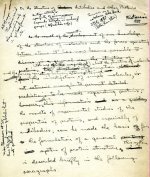 See Also: Letter from Linus Pauling to Karl Landsteiner. May 25, 1936. See Also: Letter from Linus Pauling to Mrs. Helene Landsteiner. June 30, 1943. Portrait of Karl Landsteiner, 1920s. "On the Structure of Antibodies and Other Proteins." 1937.